List analytics show you how your lists change over time, how engaged your contacts are with the rest of your marketing, and where your segment is in your marketing funnel. This can help you understand why your key segments might be decaying and what you can do to improve their engagement. 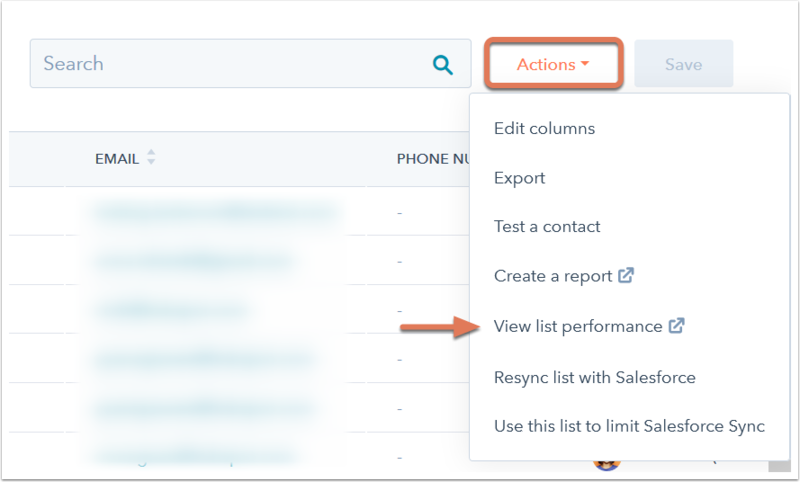 In the upper right, click the Actions dropdown menu, then select View list performance. List size over time: this shows how your list has developed over a specified time period. Click the Date range dropdown menu to filter your data. Contacts breakdown and engagments: this shows the percentage of your contacts based on the filter you select. Click the Segment contacts by dropdown menu to segment your contacts by source, country, or lifecycle stage. In the last 30 days, this is the percentage of contacts in this list who: this shows the activity of your contacts in the list over the past 30 days. These activities include opened an email, clicked in an email, converted on a form, clicked on social link, and visited your website. To return to your list of contacts, click the Detail tab.